This new Shun Premier 7 inch santoku knife is perfect for chopping vegetables and boneless meats, similar to a chef's knife. The watery appearance of the blade is a result of the hand-hammered finish, which helps to prevent food from sticking. The blade also keeps its sharp edge for longer than other knives because of its extra-hard steel core. This Shun Premier santoku knife also has the beautiful new PakkaWood handle with a walnut finish, which is unique to the Premier series. Made from a combination of wood and resin, the handle is large, comfortable, and has a striking appearance. 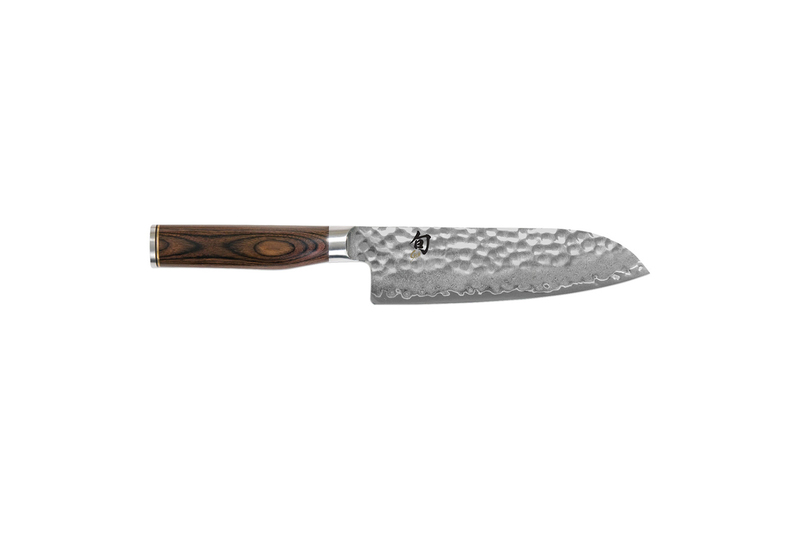 The Shun Premier santoku knife is a great substitute for a chef's knife. It's suitable for most chopping and slicing. Knife has an extremely sharp edge because the innermost layer of the knife is made from VG-MAX high carbon super steel. PakkaWood handle made from a combination of resin and white birch with a walnut finish. Limited lifetime warranty with normal use and proper care.